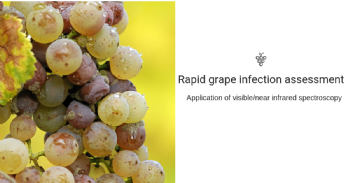 The aim of this work was to investigate the applicability of vis/NIR spectroscopy for rapid grape infection assessment in a view of a grape classification directly at the check point station entering the winery. The experimentation was conducted on white and red wine varieties, using grape bunches naturally infected with Botrytis cinerea, powdery mildew and sour rot, the major grape diseases. The research applied a compact vis/NIR device (400-1600 nm) for analysis of flows and/or non-homogeneous product. The results obtained from PLS-DA models, in validation, gave a positive predictive value (PPV) of classification between 89.8% and 94.0% for grape. The results demonstrated that optical devices are capable to provide useful information for a better management of the vinification process. Brettanomyces : aim well !